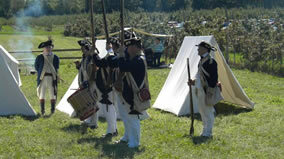 Experience firsthand a Revolutionary War camp with a demonstration from the interpreters of the Continental Army. You don’t want to miss this historic demonstration! Behling Orchards was established in 1947 and has since been passed down through 5 generations. We have grown from 6 acres of apples to over 200 with nearly 80 varieties of apples. Of the 80 varieties, there’s one special apple that we have produced named Jenna Blush which is the perfect blend of sweet/tart. For over 50 years Behling Orchards has made cider the old fashioned way. Our cider mill uses a rack and cloth technique that captures the flavor of the apples. “We use the same technique that my great-grandfather Charles did in the 1940’s. We start by picking the apples fresh from our orchard. There are no preservatives or additives in our cider, only what Mother Nature provides. Cider is available from mid-September thru November and can be purchased in ½ gallon or gallon containers in our store.